Debolon now offers a handy decision-making aid with sample folders for all collections. 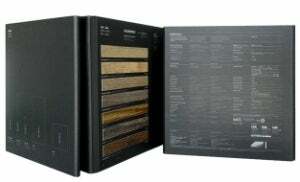 The new sample folders provide a complete overview of Debolon’s flooring portfolio. They are available for all of the company’s collections and are all clearly organised in the same way; upon opening it, the reader is first given some brief information about the company and the technical datasheet for the respective collection in German, English and French. When the sheets are unfolded, they reveal all surface designs, true to the originals, with their respective designations. "Planners and architects need all options at a glance in order to come to the right decision", says Josef Führes, Debolon’s director of marketing and sales. "With our new sample folders for all collections, we provide them with the tool they need for choosing the proper flooring." In addition to the sample folders for the flooring collections, Debolon is now also offering examination samples for all available options for the stair system in a handy sample case. It contains a large selection of designs, as well as corners, angles and noses, which can be tried out on-site and whose colours match the flooring R 200 Silence. For more information, please contact Debolon.